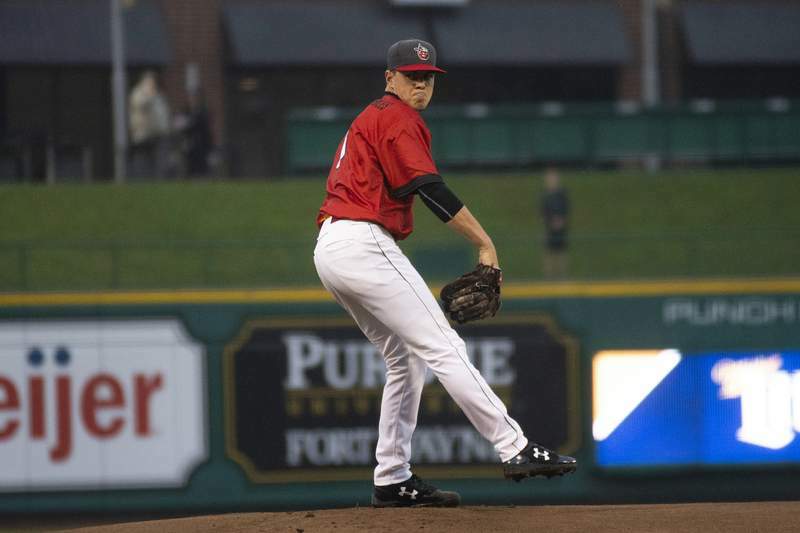 TinCaps starting pitcher MacKenzie Gore gave up four runs on six hits in three innings Friday against West Michigan. The TinCaps opened the season in April 2-9. The start of the second half isn't much better now at 0-1 with a 5-3 loss against West Michigan at Parkview Field on Friday. But it's a clean slate for the records and the playoff race in the second half with Bowling Green and Lansing snagging the two first-half playoff spots. Fort Wayne manager Anthony Contreras doesn't look at it that way, though. He wants a continuation of the progress he has witnessed in the team in the two and a half months since they arrived in Fort Wayne. "What we want is them to continue the progression they had in the first half," he said. "We finished (the first half) with a sweep against Great Lakes, we did a lot of good things there. I saw pretty much a lot of the same things (against West Michigan). "The outcome wasn't what we wanted but the way they're going about their business, the way they're competing out there. There are a couple things fundamentally and routinely on our defense that we'll address tomorrow but I think they did a good job overall and we have to keep progressing like we did." Friday's game was originally scheduled to be a double-header after Thursday's game was rained-out but additional rain Friday evening pushed the start time back from 5:30 to 8:30 p.m. and the decision was made for a single 9-inning game. While the waiting around was tough, Contreras laughed at the question of how it impacted the team but added that both teams were operating under the same delay. "Set us back? I don't think it set us back," he said. "We got batting practice on the field. They were sitting around waiting just as long. Did it affect us? No, because the other team was waiting just as long. Nobody wants to wait around and wonder when they're going to play." MacKenzie Gore started the first game and Osvaldo Hernandez was slated to start the second, but ultimately came in after three innings for four innings of relief. He gave up one run on two hits, walked two and struck out six. "For him it's about staying calm," Contreras said. "He's an energetic kid that can get in a little too fast but he's done a good job of controlling himself and being able to sit back, gather his rhythm and get ahead of guys. "The fastball looked live today early in his outing. He's done a good job missing barrels and that's all we can ask for. If he can harness his energy and let it play out in a controlled fashion, he does a good job."